The Ray family's corn field with split rail fence. 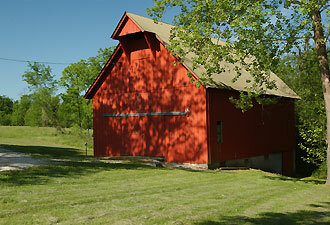 Historic barn at Wilson's Creek National Battlefield. For a unique, relaxing road trip, start your travels by enjoying the Ozarks without the crowds. You must include a day at Wilson's Creek National Battlefield, nestled in southwest Missouri near the friendly town of Republic. This site will delight anyone interested in learning about the Civil War, reliving the events of the 1860s, experiencing the quiet wonder of nature, or hiking through beautiful woodlands. The battlefield has much to offer, including the finest trans-Mississippi Civil War collection of artifacts in the United States, a library with the largest collection of Civil War books and research material available, and over 75 percent of the battlefield preserved in 2,000 well-maintained acres. No matter what you're looking for, you're sure to find it here. If you want to experience life during the 1860s, you can sit on the porch of the only historic structure remaining on the battlefield, visualize the troops surrounding the Ray House during the Battle of Wilson's Creek, and smell the smoke of cannons firing in the crisp autumn air. You will learn why John and Roxanna Ray had a large family, as you imagine the children carrying water up the hill from the spring surrounded by the beautiful colors of fall. Since their father was a U.S. Postmaster, the house was also used for mail service. The Ray children often watched riders and stagecoaches traveling along the Wire Road in front of their house. If you like activity, you can stroll down the Wire Road past the Edwards Cabin, a restored one-room log structure that shows how farming families lived. Named for the telegraph wires along this important route, the Wire Road was the main travel lane through the Ozarks from Rolla, Missouri, to Fort Smith, Arkansas, during the 1860s. 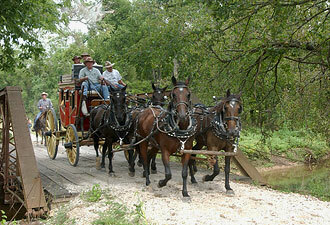 The Butterfield Overland Stage Coach used this road on its way from Missouri to San Francisco. It is possible that the Trail of Tears – the forced relocation of 60,000 Native Americans from the Springfield area to Oklahoma Territory—also followed the Wire Road. And on August 10, 1861, it brought the Civil War to the Rays' front yard. As you view Wilson's Creek through the beautiful fall colors, you are one of the over 160,000 people who visit this unique place in the heart of the Ozarks each year —historians, walkers, joggers, horseback riders, and returning and first-time visitors. Enjoy the beautiful vistas and use your imagination to bring to life the field of battle called Bloody Hill, where most of the fighting occurred. Don't forget your hiking shoes and some water as you explore, because there is plenty to learn and see on the walk or drive through the battlefield – you may be out there awhile. Come explore and meet the friendliest staff at any battlefield. If you don't have a chance to drop by this autumn, make plans to visit in August of 2011 for the 150th anniversary of the battle. You will be able to experience the sounds of battle firsthand at the Wilson's Creek National Battlefield Foundation's full-scale battle reenactment and anniversary commemoration. Today, as you drive through the stone entrance gate and split rail fences, you are entering one of the most pristine, well-preserved battlefields in the United States. You may be here to learn more about the history of the Civil War, enjoy a drive past the red maples and oaks along the five-mile tour road, or hike the 11 miles of trails to catch a glimpse of wild turkey, deer, bobcats, coyotes, cardinals, Missouri bluebirds, or eagles soaring over Wilson's Creek. 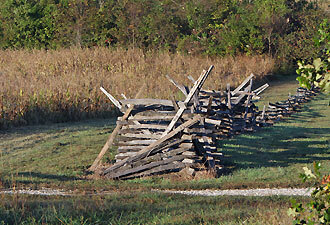 Whatever you're looking for, you'll find it at Wilson's Creek National Battlefield.